Over at Kotaku, Stephen Totilo recently posted about the common occurrence whereby the climax of a video game takes place at the very end of the experience, in a boss battle or similarly epic event. Very few games follow the pattern present in most books and movies, which allows for a time of resolution and denouement after the climactic moments. Even those games that do have a satisfying resolution often achieve that resolution through cut scenes, movies and credit sequences, instead of in an interactive manner. Since interactivity is what makes video games a unique storytelling device, why do gamers so rarely get to interact with the denouement of the games they play? A few games prove to be exceptions to the rule. Totilo mentions Ico as one game that has a playable denouement, as well as the trend in open world games to allow the player to continue after the climactic moments of the main plotline. In Grand Theft Auto 4 the option to continue is present, but besides a few players being dead there is very little resolution to be found after the conclusion of the main plot. Fable 2 does a slightly better job of showing the player what their actions meant: depending on player choices, the world of Albion will respond to the things that you’ve done over the course of the game’s climax, and new options open up to give a hint at what the main character might go on to do with his or her life. This is a much more satisfying experience than watching a pre-rendered movie and turning off the console. It allows the player a time to reflect on what they’ve done, and consider what the future holds. A few other recent games have done a reasonably good job of providing a sense of well-paced resolution after the climax of the game. (Since I intend to discuss the endings of games, there may be some slight spoilers ahead, though I intend to keep it to a minimum.) In Braid, the level directly after the climax provided a sense of calm, comforting denouement. Moving through those final screens, exploring and reading the last passages of text allowed the player to take their time to think about what they’d seen and done. 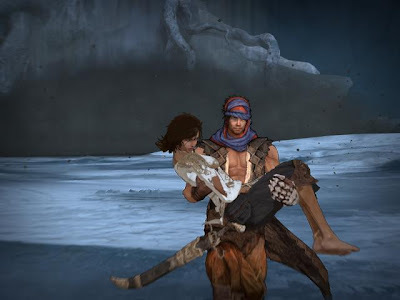 The new Prince of Persia has a very compelling ending sequence as well. After battling the final boss in a dramatic and epic sequence of events, the game begins to roll the credits, but the player remains in control. What follows is a series of fairly simple tasks, slowly and carefully paced, and a few simple platforming challenges in the beautifully restored world. While the events that take place are emotionally compelling, the sequence is in no way as intense or difficult as almost any other part of the game. It feels like a relaxing, natural continuation to the game and overall arc of the story. So many games end with non-interactive sequences when the story could just as easily be resolved using the same gameplay present in the rest of the game. In games with large casts, like Lost Odyssey, the final movie(s) or cut scene(s) will often have each character reacting to the events of the climax and deciding what to do next, but why not let the player wander around and speak to the characters whose opinions matter to him or her the most? If there are characters I didn’t much care for throughout the game, I care much less about what they have to say than the others. Allowing even the most minor interactions and player control beyond the ending continues the sense of connection between player and game. Instead of taking the reins away entirely, little moments like the dialogue choices presented at the end of Mass Effect make the ending of a game feel like the satisfying conclusion a personal experience, instead of the end of a journey that we took with a stranger who is now beyond our reach and interest. After spending so much time making a story our own, inhabiting a new and exciting world, and watching our characters develop, why should we have that personal experience wrenched from us in the final moments? Why not extend that into another short section of the game, and let the player control their own proper resolution? There should be more to triumph than a video and a credits sequence. We have movies for that.